Cyberbreaches aren’t just in the news—they are the news. Yet headlines rarely mention the No. 1 source of those breaches: weak or stolen passwords. Whether they involve malware, hacking, phishing, or social engineering, the vast majority of breaches begin with account compromise and credential theft, followed by dormant lateral network movement and data exfiltration. In fact, weak or stolen passwords account for a staggering 81% of breaches, according to the Verizon 2017 Data Breach Investigations Report. 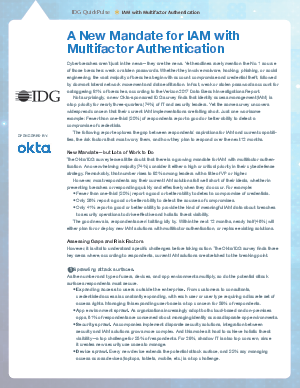 Not surprisingly, a new Okta-sponsored IDG survey finds that identity access management (IAM) is a top priority for nearly three-quarters (74%) of IT and security leaders. Yet the same survey uncovers widespread concern that their current IAM implementations are falling short. Just one worrisome example: Fewer than one-third (30%) of respondents report a good or better ability to detect a compromise of credentials. The following report explores the gap between respondents’ aspirations for IAM and current capabilities, the risk factors that most worry them, and how they plan to respond over the next 12 months.